Food Network host and author Simon Majumdar and I first met last August in Las Vegas outside the Kitchen Arena that was set up as the battleground for the World Food Championships: The Ultimate Food Fight. 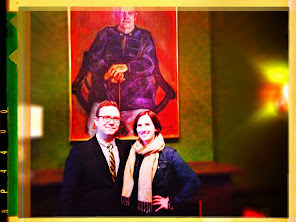 My buddy Ben Vaughn introduced us, and I handed Simon a copy of our cookbook, The Southern Vegetarian. We immediately started talking food. He told me that since his family is from India, vegetarian meals were not uncommon. Life Saving Dahl, he told me, was his favorite. He was kind enough to share the recipe with The Chubby Vegetarian -- check back here tomorrow for this amazing recipe! Simon Majumdar, Ben Vaughn, and Justin Fox Burks at the World Food Championships in 2013. 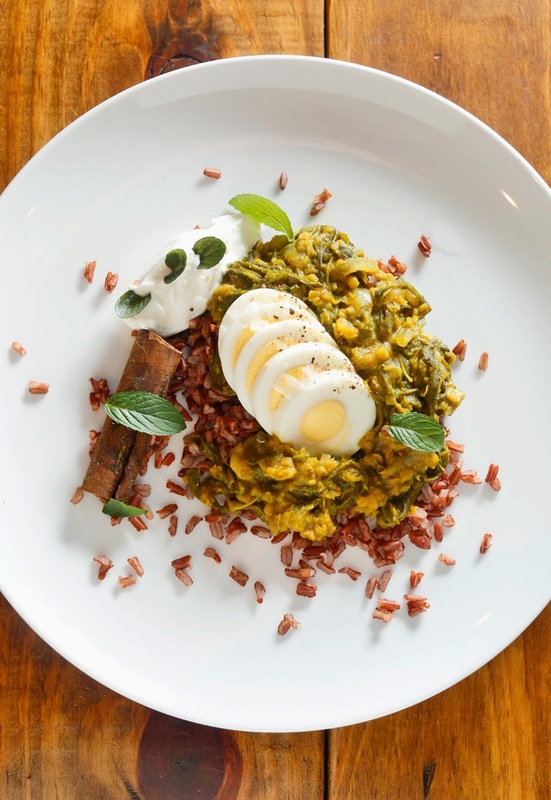 Cooking this dish taught me so much about how to achieve the deep and complex flavors of traditional Indian cooking that elevate simple ingredients like lentils and onions and result in a complex, wonderful dish. One of the many takeaways for me was the use of a lemon cut into eighths and tossed into the stew in order to add acidity. I'll be using that trick again and again. A big thanks to Simon for sharing the recipe and answering our questions. Simon: This is very much a family dish. My Bengali great aunt (who was closer to me than my own grandmother and who I called 'grandmother') taught me how to pre-toast the red lentils in a dry pan, stirring with my fingers. She claimed it added a nutty flavor to the red lentils and helped them absorb more flavors from the spices. I am not sure if that is true or not, but it is a very comforting process, and I cannot make the dish without doing it now. It just wouldn't seem right. It is our family's go-to comfort dish, our chicken soup. I make it any time that both body and soul need nourishing. I have even got my wife addicted to it now, and she requests I make it every time she is feeling under the weather. 2. TCV: It's a Tuesday night and you're at home just hanging out. There's no one around to impress. What are you cooking? Simon: I know this is a vegetarian blog, but my ultimate comfort meal is just a simple roast chicken. I always spatchcock mine and roast in a cast-iron skillet over a bed of chopped onions. The onions confit in the chicken fat and the whole surface of the bird becomes crisp. I usually make my own roast garlic mayonnaise to accompany it and eat the chicken with my hands, tearing bits of flesh off to dip in the mayo. 3. TCV: I made a lot of changes after I lost my mother in 2008. Mainly, I improved my quality of life by losing 75 pounds and running marathons. You cite the same cause as a reason for shaking things up in your own life. What one piece of advice would you give to someone who wants to make a big change for the better? Simon: My advice is to follow the thing that you are most passionate about. 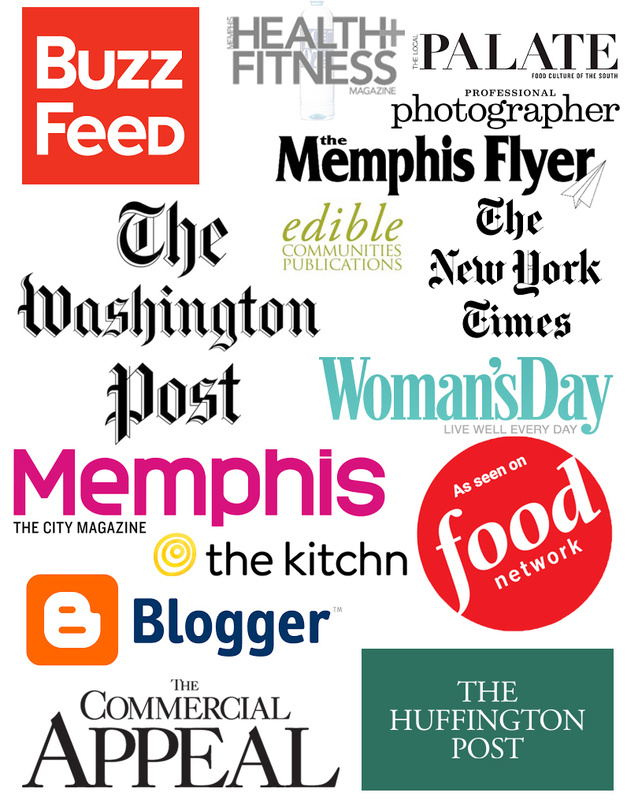 Food has always been my obsession, and I quit my job in publishing 2006 to go around the world and eat. It changed my life and my career. I know that not everyone has the time, money, or inclination to do something that drastic, but I do believe that if you set yourself stretching challenges, great rewards will come. It could be, like you, losing weight. It could be to cook more food at home, or it could be to travel or study. My only request is that you don't play at it. Make a goal and go for it. Just in case you are wondering about my next goal…I turned 50 last week and have set myself a challenge of appearing in a masters body building competition in 2015. It's going to be tough, but I am determined to give it my best shot. 4.TCV: What ingredient or technique has your undivided interest right now? Simon: I am really fascinated by old-school techniques and dishes right now. I think a lot of them became classics for a reason and have been sadly forgotten. I don't get to spend half as much time in my kitchen as I would like, but when I do, I love to play around with the classic old recipes like Lobster Newburg or Steak Diane. 5. TCV: From your travels to your books to your work on Cutthroat Kitchen, Iron Chef America, The Next Iron Chef, Extreme Chef, The Best Thing I Ever Ate, and many other Food Network shows, you have experience with a whole lot of food, to say the least. So, what makes a dish memorable for you? Simon: There are so many elements to a great dish. Terrific ingredients, of course, particularly when coupled with impeccable technique that lets those ingredients shine. As well as all of these, of course, there is context. Does a hot dog ever taste better than at a ball game? Does a cold beer ever taste better than at a summer's day picnic? I have been traveling around the world for the last few months, and I am certain that the great meals I had were made even better by eating them in the places I visited and with the people I met. - The coating can easily be too wet. It seems crazy for a recipe to call for half an egg white, but unless you aim to double it and make 5 cups of almonds, just go with it. - Toss the almonds for 10 minutes in a skillet heated to medium on the stovetop before toasting them up in the oven. It's less messy overall. - Skip the 1/4 cup of light brown sugar listed below and just use honey if that's your preference right now. - Add a little powdered sugar to the cocoa (much more palatable and less bitter that way). Preheat the oven to 300 degrees. Whisk the egg white fast until it almost comes together like meringue. Add water and whisk again. Stir in the honey, light brown sugar, and mix well. Add the almonds and stir them to coat. Sprinkle in the cinnamon, cayenne, ginger, ancho chili, smoked paprika, and salt and pepper and stir to coat the almonds. Now heat butter in a medium pan on medium heat. When it melts, pour in the almond mixture. Stir constantly and watch over the almonds for 10 minutes or until they are sticking to the spatula and no liquid remains in the skillet. Transfer almonds in a single layer onto a parchment-paper lined, rimmed baking sheet. Place in the oven for twenty minutes and them remove them and stir them around. Bake for another 20 minutes. Remove from the baking sheet and let them cool on a plate or two. 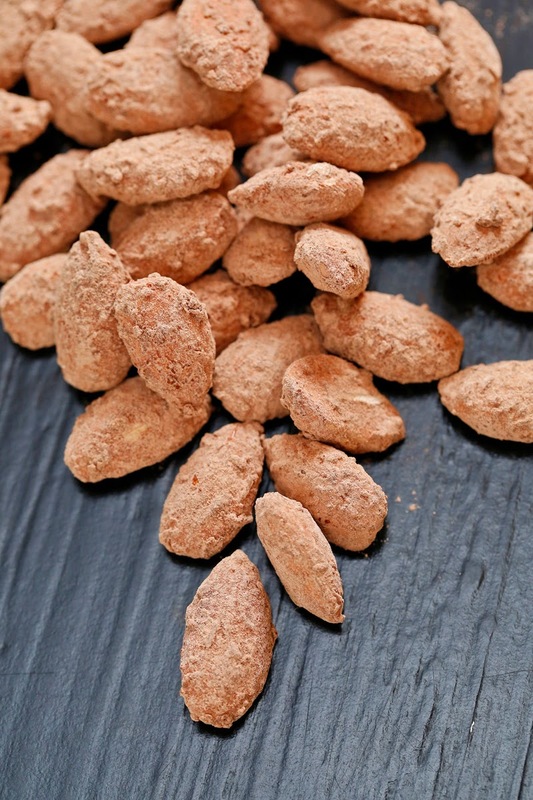 For cocoa almonds (they're less sticky than just leaving them plain), place half the almonds along with the cocoa and powered sugar into a bag or lidded container and shake to coat. We love making banana muffins or banana bread for people who need a little sweetness in a tough time. A tangible and quick response feels right, and having a go-to recipe or two on hand is nice. 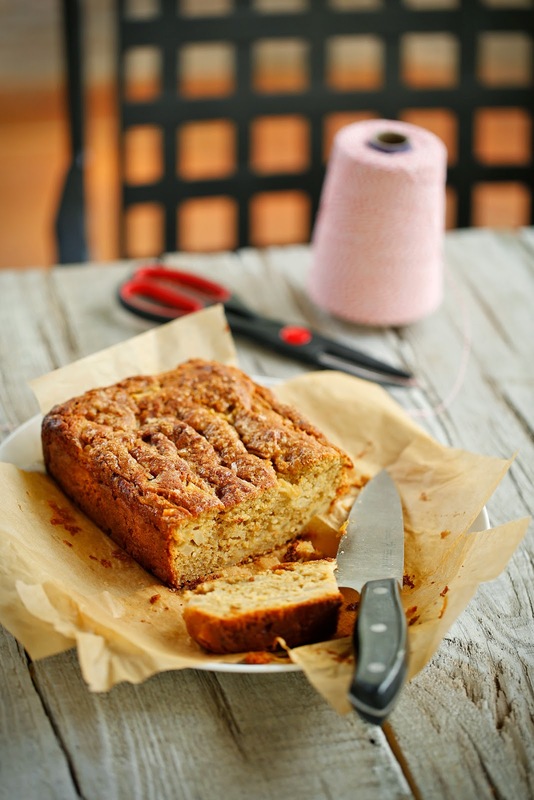 Banana bread is something pretty much everyone likes and has good memories of, and on the practical side, we always have the ingredients for it on hand. We don't tend to eat a lot of 'real' bread these days (unless we're out to dinner here or here -- then trying the amazing bread and butter is absolutely necessary). Recently, we've been modifying old TCV recipes to make them lean more toward being either Paleo or gluten-free. Looking for a new challenge this week, we started working on pear bread. At times, pears seem to be kind of an overlooked fruit, don't they? They're so mild and innocuous but still so good! We wanted to showcase them in something new besides a crumble, tart, or salad. Making our Simple Orange Pear Butter first gives you something good to have for breakfast on top of oatmeal or toast -- and then you can use up the rest in the bread recipe below. Preheat oven to 350 degrees. Whisk together the flour, almond flour, baking powder, baking soda, xanthan gum, ginger, and salt and set aside. Combine the pears, orange juice, and vanilla and set aside.Whisk together the eggs, brown sugar, oil, Simple Pear-Orange Butter, orange zest, and crystallized ginger. Add the flour mixture and the pear mixture to the previous wet ingredients and mix. Pour batter into a bread pan that's been lined with parchment paper. Dot the top with pieces of olive oil margarine and, if you like, sprinkle the top with a little seat salt, brown sugar, and ginger. Bake for 60 minutes or until the top is golden brown and a knife inserted into the middle of the bread comes out clean. Allow bread to cool before slicing and serving. Put pears, apple, orange juice, cinnamon, honey, and salt in a medium saucepan. Simmer on medium-low for about 30 minutes or until the fruit is tender and sauce has reduced by half. Set aside to cool. When the pear butter is cool, blend it until its consistency is very smooth. Store it in an airtight container in the fridge for up to 3 days. The word 'cancer' sounds completely different when it's used to describe someone close to you. It echoes in a way that never really fully dissipates until the word is again uttered and the echo starts over again. Regular readers of our Facebook page have figured out by now that my dad, Graham Burks Sr., has been diagnosed with pancreatic cancer. Thankfully, he qualified for Whipple surgery, which he had a few weeks ago. Now he's recovering from that before starting chemotherapy next month. This, needless to say, has us all a bit shaken, but it has done something else as well. 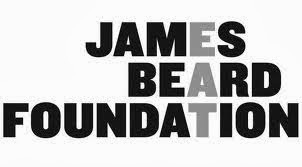 It has us resolute and willing to fight. In addition to the regular doctor-prescribed treatments, we are arming ourselves for a food fight. Not the kind you had in grade school that started when someone lobbed a greasy hash brown across the cafeteria, but the kind of food fight that starts with knowledge and understanding and then yields some truly healthy dishes that nourish the body and help to fight cancer from the inside out. 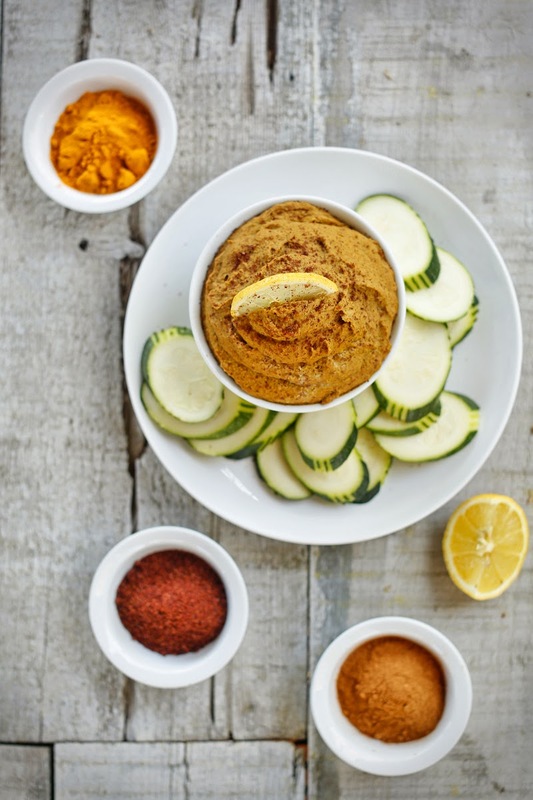 With this hummus, we are focusing on antioxidants. According to The National Cancer Institute, "Antioxidants are chemicals that block the activity of other chemicals known as free radicals. Free radicals are highly reactive and have the potential to cause damage to cells, including damage that may lead to cancer." So we have loaded this with some of the top-performing antioxidant foods (according to WebMD) like red beans and pecans and paired them with some of the most potent antioxidant spices (according to Science Daily). The kicker is that it tastes great and is similar to a warm curry mixture like masala because of the cinnamon. All right, Dad: let's fight this together. In a small frying pan over medium heat, warm the olive oil and add the garlic, cinnamon, turmeric, and sumac. Cook until the rawness is gone from the spices and the garlic has softened. Into the work bowl of your food processor, add the oil and spice mixture from the frying pan, pecans, red beans, and lemon juice. Blend until smooth. Add salt to taste and blend until incorporated. This is a continuation of our grilled spaghetti squash fascination. We love the stuff. This came about after some leftover Spaghetti Squash Ribs were chopped up and piled up high on a waffle for a super-quick lunch the other day. Loved it so much we just had to share it with you. 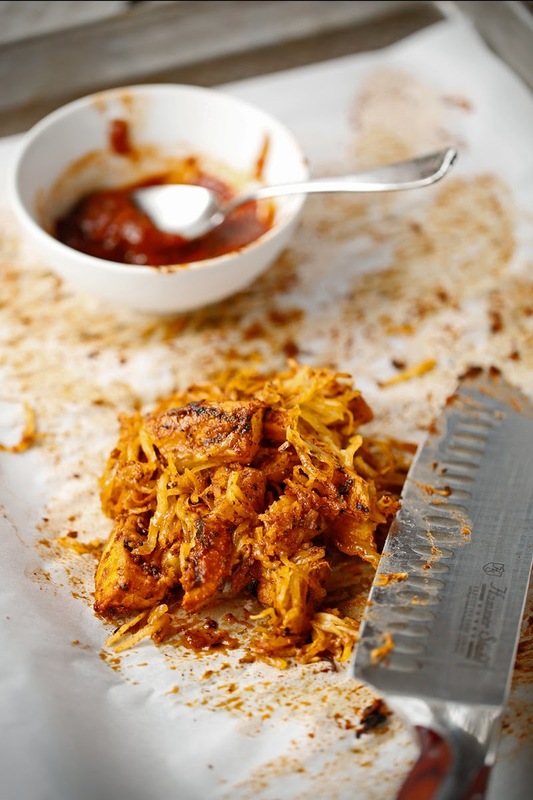 This is reminiscent of the ubiquitous BBQ jackfruit recipes that are out there on the internet, but it uses a readily available fresh product instead of a canned one. The texture is just perfect! In addition, the hot grill adds that indescribable smoky awesomeness that BBQ needs. Give this a shot! It's so easy, and we think everyone will love it. Preheat your outdoor grill to high. Using a serrated peeler or a sharp knife (and plenty of caution! ), peel the squash. Cut the squash lengthwise and scoop out the seeds. Cut into 1/2-inch slices and discard the ends. On a large sheet pan, toss sliced squash with the canola and sesame oil and then the dry rub until it's well coated. 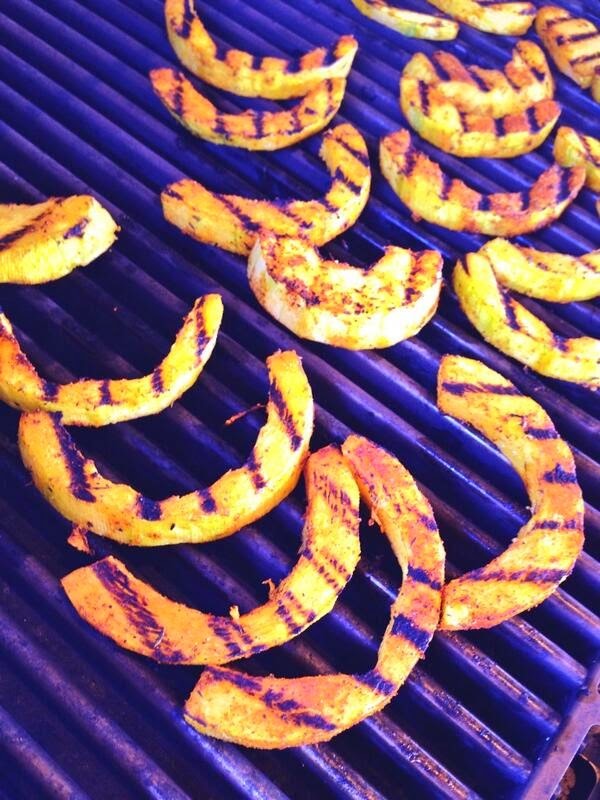 Grill slices of squash for 4 to 5 minutes per side or until cooked through and well-marked by the grill. Remove the squash and place it on a cutting board; allow it to rest for 5 minutes. Roughly chop the squash into about 1-inch pieces. Toss with the BBQ sauce and pulling some of the chopped pieces apart as you go. 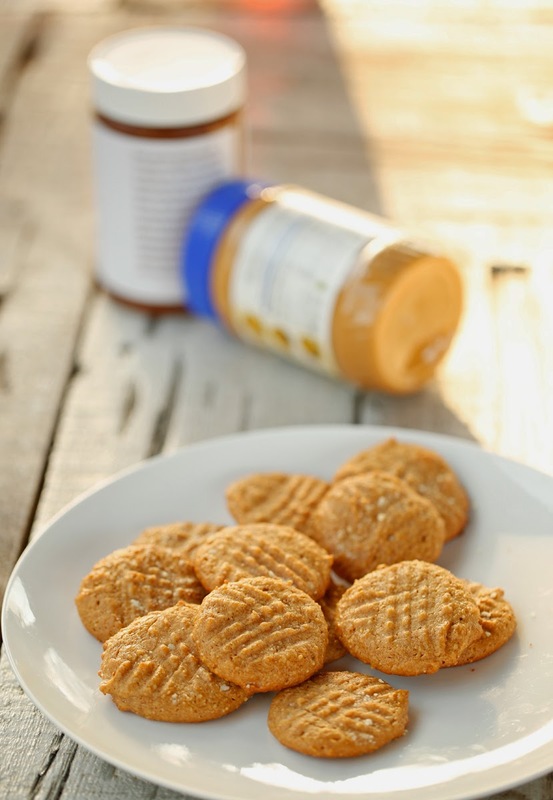 Inspired by the 3-ingredient peanut butter cookie recipe that's all over the internet, these take a bit more effort, but not that much more. They'll solve that annoying problem of too many jars of half-gone nut butters in the fridge -- any mix of different kinds works well.